According to our seven-year-old neighbor, the correct name for an oak is acorn tree. After all, he reasons, if the parent of a peach is a peach tree, of a lemon is a lemon tree, why would the parent of an acorn be called an oak? He has a point. We wouldn’t even attempt to explain to him why acorns are technically fruit. He, and we, tend to think of the word fruit as applying only to such things as apples, plums, and cherries. But walnuts, almonds, and filberts are fruits, for, according to my dictionary and any botany instructor, the definition of a fruit is the riped ovary, or ovaries, of a seed-bearing plant. Fleshy fruits, often edible, may be more familiar to us, but there are many more dry fruits than fleshy ones, especially in the wild. Think of the samaras, one-seeded fruits with wings, borne by maple and ash and elm trees. Consider podlike fruits with seeds inside like those of magnolias and pines. Don’t forget nuts, most of which are one-seeded fruits contained in a hard shell like walnut, beech, hickory, and one of the most important to non-human critters, the fruit of the oak — the acorn. With nearly 60 varieties of oak trees producing fruit all across the United States, it’s the good fortune of all who eat them that acorns possess high food value. They’re rich in carbohydrates, fat, and vitamins. Most other nuts are the bounty of larger, gnawing animals because their hard, protective shell is hard to crush. That makes the acorn of even greater value to the diet of smaller animals, birds, and insects. Every oak tree doesn’t produce a crop every year. It varies by species but, on average, any given oak produces a crop once every three or four years. Luckily for those who rely upon acorns for food, all trees aren’t on the same schedule, so there’s a fresh food supply every year. Having moved into the Sierra Nevada foothills, we live in an area where oaks are the dominant (almost the only) tree. To get an idea of which creatures feed on their fruit, we did a little research. If our visitors are typical of those feeding on acorns in general, we can expect the following: several types of squirrels (two species so far), raccoons and deer (already accounted for), and bears (rarely, we’ve been assured, and only in winter). We are probably typical of oak areas around the country. 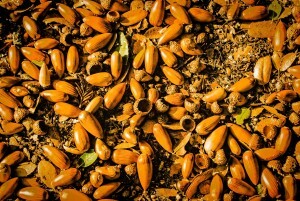 Once the shells open, birds, too, depend upon acorns to fill their hungry bellies. We’ve already seen them all and the acorn crop isn’t even ripe — quail, wild turkeys, crows (in our case ravens), and smaller species such as nuthatches and titmice. And not to forget our nearest and most vociferous neighbor, one who relies entirely upon acorns and insists upon storing them in every tree, telephone post, or attic, California’s Acorn woodpecker. We’re lucky to have aluminum siding because Acorn woodpeckers compulsively drill holes and bury acorns. We’ve read of a colony of these birds implanting tens of thousands of nuts in a single tree, but our nearest example can’t have over a couple of hundred holes. Of course, they could hold more than one acorn. There are years when the acorn crop is particularly lean, and then the situation can be critical for those feeding upon acorns. According to what we’ve heard, 1968 was such a year in the East. Since there were so few acorns, squirrels migrated frantically in search of food, even crossing throughways and rivers. They were even reported trying to cross the Hudson River, but no word whether they were successful. As might be expected, only a tiny percentage of acorns germinate and become trees even during a good year. In a study made some years ago, scientists concluded that if an average mature oak produces a crop of 5,000 acorns, 83 percent will be eaten by deer and other animals; 6 percent become food for weevils and larvae; and most of the remaining are naturally imperfect and incapable of germinating. 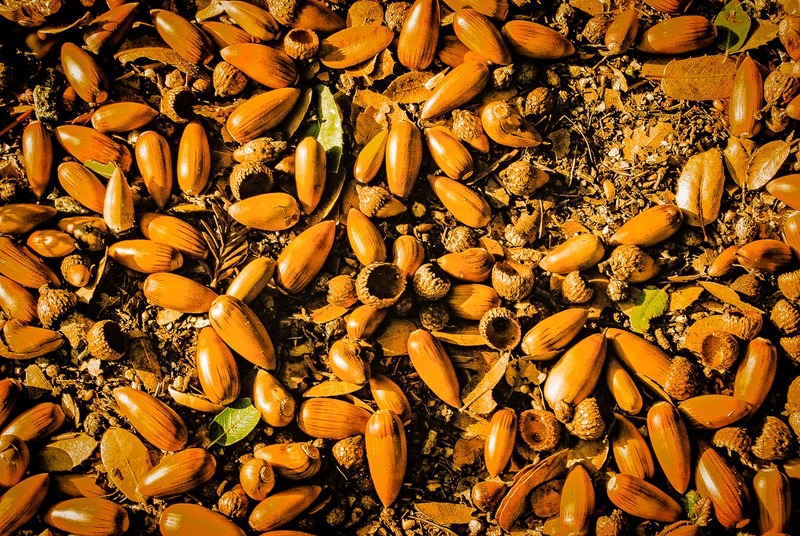 That leaves less than 1 percent, fewer than 50 acorns, to sprout, and half of them will die as seedlings. It’s a wonder we have any oak trees at all. Not all acorns are created equal, insofar as flavor is concerned, and that may contribute to their survival. Red and black oaks produce bitter acorns, while those from white oak are milder. We can attest to that. One year we were camped in coastal Virginia and had access to acorns from several different kinds of oaks. Being naturally curious, we decided to run a little test of our own. We spent several days leaching tannin from both kinds of acorns soaking them overnight, changing the water, soaking them even longer. Our conclusion: the scientists were right. Only acorns from white oaks are palatable; but at least the rest made acceptable duck food. Lowell, I’m enjoying your blogs. Thank you. Debbie and I just rebuilt our cabin (originally built in 1991). When it was constructed 24 years ago we had to remove a couple of Blue Oaks (they were small) to make room for the concrete pad. Those little trees must have been the granary for a family of Acorn Woodpeckers because from the beginning of the cabin’s life it was attacked by woodpeckers. Last year, when it was rebuilt (new siding and roofing) we removed thousands upon thousands of acorns. We replaced the original wood with Hardy Plank ( a concrete product that looks like wood but is fireproof and woodpecker proof.) …so i particularly enjoyed this post of yours. Glad you like the blog. Those Acorn Woodpeckers – either people love them or hate them. I wrote an article about these clown-faced critters (Master Carpenters) and got more emails than almost anything I had written. Everyone wanted to know how to protect their homes from the woodpecker holes. I’ve never heard of Hardy Plank – that’s good to know.